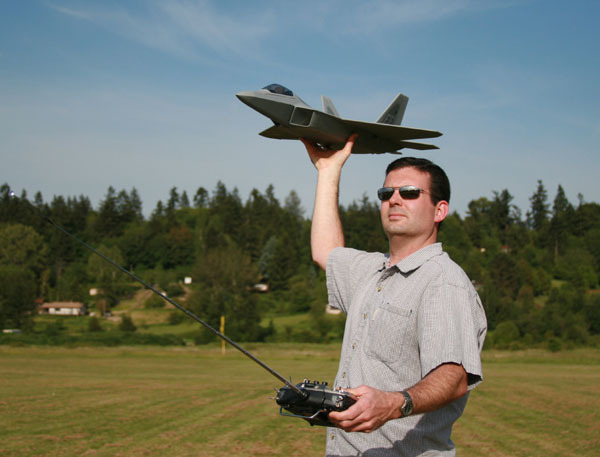 F/A-22 Raptor you can build! To download the 22-page PDF construction guide, Click Here. 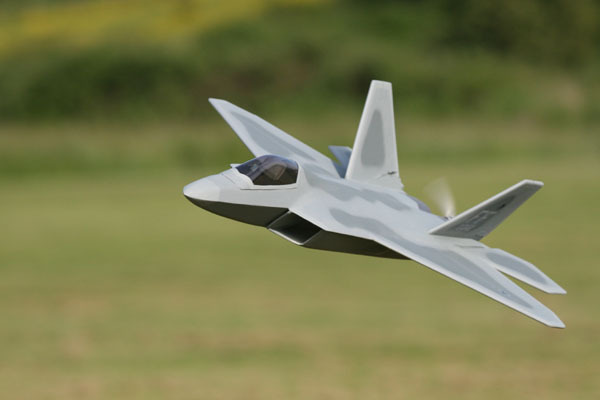 The design goal of this model was to capture the unmistakable look of the F/A-22 Raptor in an easy-to-build semi-scale model that could be flown in small fields. 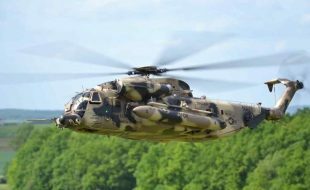 Good small field performance was achieved through a combination of low wing loading (only 10.5 oz per sq ft), high power loading (160 watts per lb), and excellent control response (provided by the flaperon/stabilator control system). 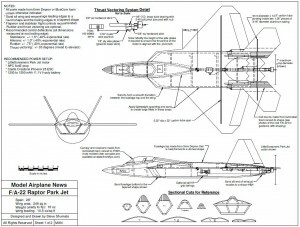 This design also features a functional thrust vectoring (TV) system in the pitch axis, just like the real F/A-22 Raptor. The TV system provides incredible maneuverability, enabling amazingly tight turns and loops, flips, tailslides, and greatly enhanced pitch control at low speeds. The TV system is electronically mixed to the stabilators using transmitter mixing, and can be turned on and off in flight with a switch. But for those that prefer to build a simpler model, the TV system can be deleted completely—this model flies well and is still very maneuverable without it. While there are many motors that can be used to power this model, the LittleScreamers Park Jet motor (available from Hobby Lobby) is highly recommended due to it’s very light weight (which makes balancing easier), high power (185 watts), and small 6-inch diameter prop (which reduces prop torque effects in flight and also reduces gyroscopic effects during thrust vectoring). This motor provides fantastic performance on the F/A-22 park jet, including unlimited vertical and a top speed of 70 mph. The F/A-22 Park Jet can accommodate up to a 7 inch diameter prop. 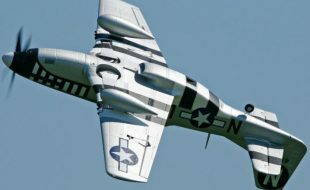 The control system on this design features full-flying stabilators and flaperons, which provide excellent control response at both high and low speeds. Flaps and elevator-to-flap mixing can be incorporated for even better performance, but aren’t required. 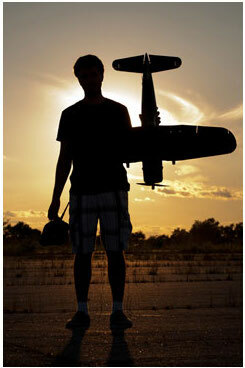 Rudders are optional as well, but are handy to have for aerobatics and for improved slow flight control. The simple sheet foam construction used on this model builds very quickly. If you’ve never build a sheet-foam model before, you’ll be amazed at how much quicker and easier they are relative to an all-balsa model. 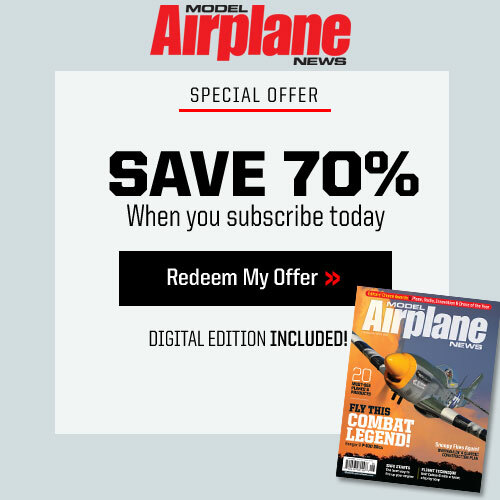 This design also features a simple flat sheet-foam wing, which performs very well in flight and eliminates the complexity of a built-up wing. Construction Either Depron or BlueCor fan-fold foam can be used to build this model. Both types of foam weigh the same, but Depron has a smoother finish and produces a better-looking model. 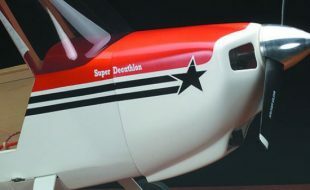 Depron is available at many local hobby shops or can be ordered online from companies such as RC Foam (www.rcfoam.com). Several types of adhesives are used to build this model. Foam contact glue (such as UHU Creativ for Styrofoam) or foam-safe CA works best for general construction. Epoxy should be used for all critical joints such as the wing spars and motor mounts. 3M 77 spray adhesive should be used to tack the paper parts templates to the foam and to laminate foam pieces together. 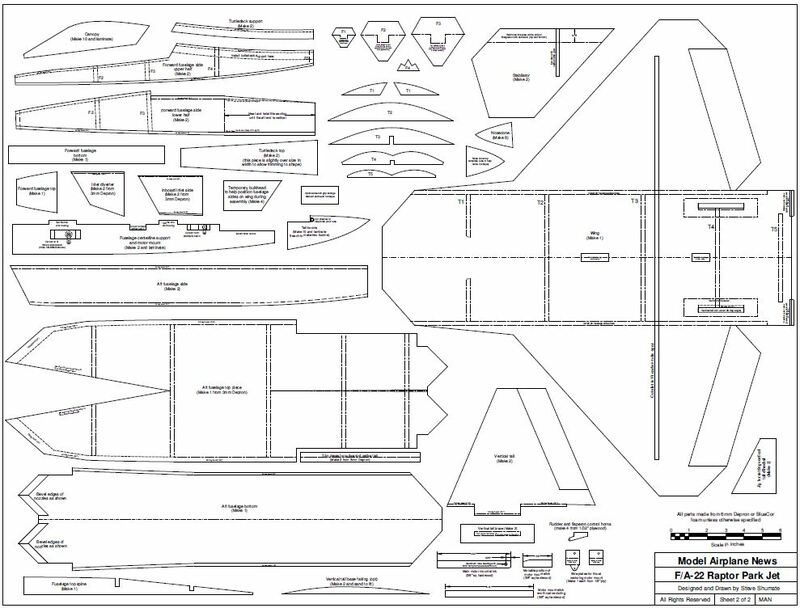 Begin by cutting out all of the parts templates from the plans, leaving a roughly 1/8” margin around each piece. Lay out all the templates on the foam sheets to minimize waste, and then lightly tack each template to the foam with 3M 77. Then cut out all the parts with a sharp hobby knife. To help keep track of the parts, keep the paper templates on until you’re ready to use each part. For parts that require more than one piece, just use the parts you’ve already cut out to trace the outline onto new pieces of foam. Wing Cut a slot in the wing to fit the carbon wing spar. Lay the wing on wax paper over a flat surface and use epoxy to glue the spar in place. Mixing microballons into the epoxy is highly recommended to reduce weight and help fill gaps better. Place another sheet of wax paper and some heavy books on top of the wing to hold it flat as the glue cures. Once the glue has cured, sand the leading edge round and taper the trailing edge. Apply a strip of 3M Gift tape around the entire leading edge for smoothness and improved durability. Then cut the flaperons free from the wing. Lower Fuselage Laminate the two fuselage centerline support pieces together using 3M 77. Then bevel the top and bottom edges of the aft fuselage sides as indicated on the plans, using a hobby knife and a straight-edge. Be sure to make mirror-image left- and right-side pieces. Place the wing upside-down on a flat surface, and then glue the two aft fuselage sides and centerline piece onto the bottom of the wing. Use the four temporary bulkheads provided on the plans to ensure the fuselage sides are glued on at the proper angle. Remove the temporary bulkheads after the glue dries. Cut bevels on the edges of the forward fuselage pieces as indicated on the plans. Then form the curvature in the lower forward fuselage sides, using a heat gun to heat and soften the foam before gently bending it with your hands. 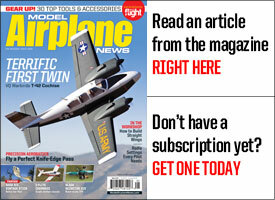 See the photos for how this curvature should look (note the online supplement features even more construction photos). Next glue the bottom half of the three fuselage bulkheads to one of the lower forward fuselage sides. Then set the fuselage sides upside-down and flat on the workbench, apply glue to the edges of the bulkheads, and glue the forward fuselage assembly together. After the glue has dried, glue the aft ends of the fuselage sides together, heating the foam if necessary to bring the pieces together easily. Glue the forward fuselage lower assembly in place on the front of the wing. Make sure the aft end of the forward fuselage assembly mates with the forward edge of the centerline support piece. 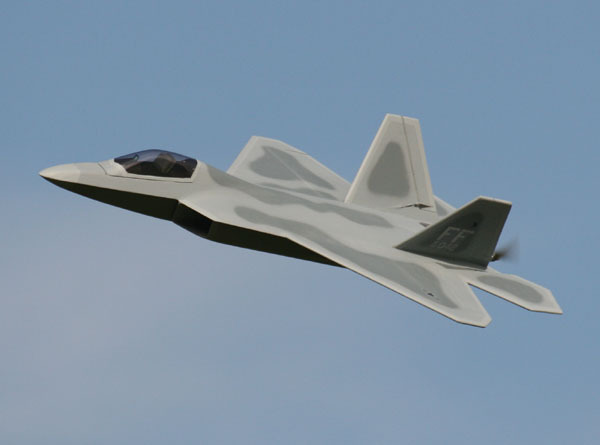 Note the top edge of the forward fuselage droops down a few degrees relative to the wing to achieve the scale F/A-22 nose droop. This droop is set automatically by the shape of the parts, but some trimming may be necessary. Motor Mount Cut the square hardwood motor mount sticks to length. Drill the holes for the brass tube pivot bearings, and then glue the bearings in place with thin CA. Chamfer the ends of both motor mount sticks as shown on the plans and wrap the aft end of the main stick with packing tape to ensure a low friction joint. Cut and glue the two plywood side plates to the movable mount stick using epoxy. After the glue is dry, drill the pivot hole through both side plates at the same time, making sure it is perpendicular to the plates (use a drill press). Install the pivot bolt and make sure the mount pivots smoothly, sanding if required. To minimize strain on the thrust vectoring servo and also prevent pitch trim changes with throttle changes, it is very important that the thrust line of the motor runs directly through the pivot bolts. Glue the completed motor mount into the slot in the aft fuselage centerline support using epoxy. Stabilators Press a circular notch along the length of the aft edge of the wing piece using the aluminum tube stabilator bearings. Then glue the stabilator bearings into place using epoxy. Use small strips of tape to hold the bearings in place and insert the carbon tube stabilator pivot into the bearings as the glue cures to make sure they stay perfectly aligned. Sand the leading edge of the stabilators round and the trailing edge to a tapered shape. Apply a strip of 3M Gift tape to the entire leading edge for smoothness and durability. Lay the wing assembly upside-down on a piece of wax paper on a flat surface. Slide the carbon pivot tube, end stops and control horn through the aluminum bearings. Once everything is in place and aligned, glue the end stops into place with CA (but don’t glue the control horn yet). Then glue both stabilators to the carbon tube using epoxy, making sure they are flush and flat with the wing. Install the stabilator servo into the pre-cut slot in the fuselage centerline support, using thick CA or dabs of epoxy to secure the servo. Install the music wire pushrod and connect it to the stabilator control horn. Once everything is aligned, glue the control horn into place with CA. For extra strength, I recommend adding small strips of fiberglass chordwise to the roots of the stabilators, both top and bottom. These aren’t required for normal park flying, but if you plan to fly fast or land in tall grass they add extra insurance against structural failure. 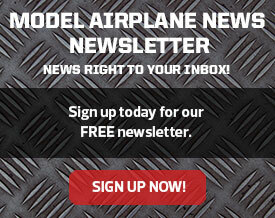 Install the thrust vectoring servo into the pre-cut slot in the fuselage centerline piece. A strong (40+ oz/in torque) metal-geared servo is required since a plastic-geared servo could get stripped when the prop hits the ground during landings. 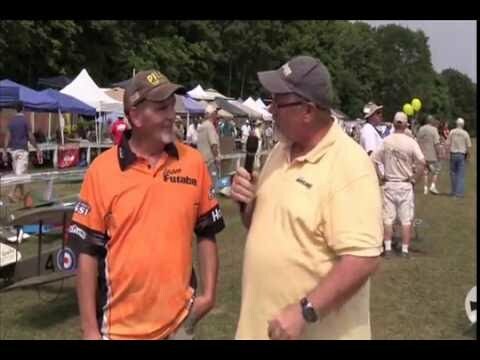 The Hitec HS-85MG worked well on the prototype and is highly recommended. Install the 1/16” music wire pushrod, including pushrod guides as required to eliminate flex (scrap carbon fiber tube works well for this). Verify that the thrust vectoring system moves freely and with minimal slop. Upper Fuselage Glue the upper half of each of the three forward fuselage bulkheads to the matching lower half. Bevel the upper forward fuselage sides, then test fit and trim as required. 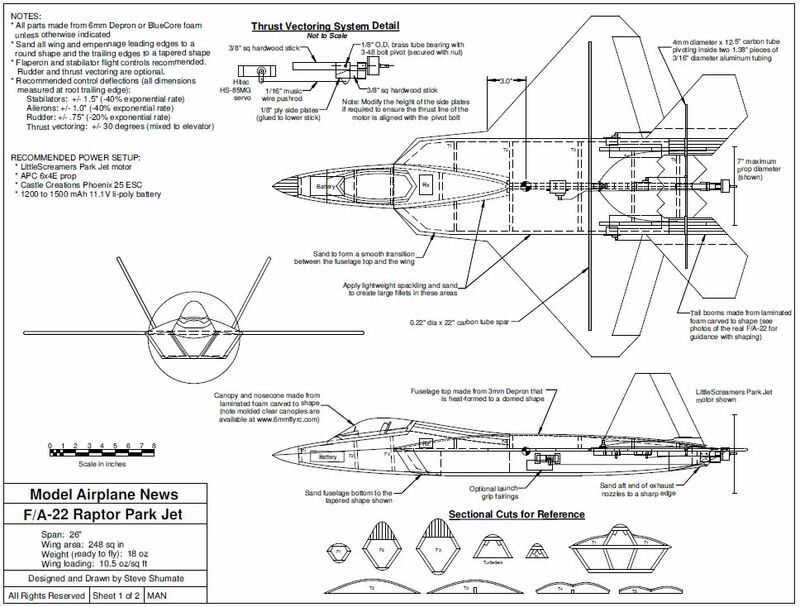 Note the upper and lower forward fuselage pieces should meet to form a sharp edge to give that scale Raptor look. Once satisfied with the fit, glue the upper forward fuselage sides onto the bulkheads and lower fuselage sides only (don’t glue the aft part to the top of the wing yet). Glue bulkheads F4 and F5 to the top of the wing in the locations shown on the plans. Then glue the aft part of the upper forward fuselage sides to the top of the wing and the bulkheads. Cut bevels in the two turtledeck support strips and then glue them in place. Then glue the two turtledeck top pieces in place, one at a time so they can be formed to the proper curvature. Once the glue is dry, carve and sand the turtledeck roughly to shape. Laminate the nosecone and canopy pieces using 3M 77. 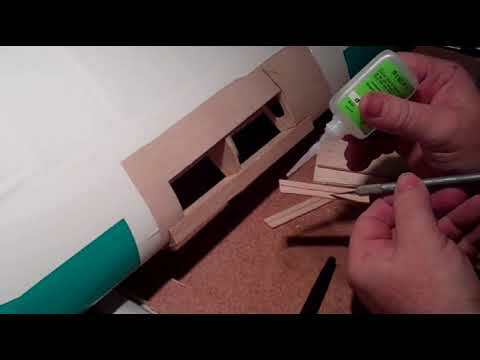 Then glue the nosecone block to the front of the fuselage. Once the glue has dried, trace the top outline of the nosecone onto the foam (using the provided template) and cut it and sand the nosecone to shape. 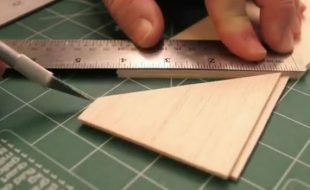 Carve the canopy to shape using a similar procedure. Laminate the tail boom pieces together using 3M 77, cut a small channel to clear the stabilator pivot tubes, then glue the tail boom blocks to the aft fuselage. Sand the tail booms to shape (see the photos for guidance).Next install the flaperons. Cut a 45 degree bevel in the leading edge of the flaperons, and hinge them with strips of 3M Gift tape across the top and bottom. Trim as necessary to provide a small and parallel gap from the leading edge of the stabilators. Install the flaperon servos, control horns, and pushrods. Vertical Tails Glue in the vertical tail support pieces under the wing using 3M 77. Sand the leading edge of the vertical tails to round shape and trailing edges to a tapered shape. Apply a strip of 3M Gift tape to the leading edge. If installing rudders, cut them free from the vertical tails, bevel the leading edges, and hinge with strips of 3M Gift tape. Cut the vertical tail mounting slots in the aft wing, using the foam jigs provided to ensure the proper dihedral angle. Cut all the way through the support pieces mounted underneath the wing. Glue the vertical tails in place with epoxy, again using the foam jig pieces to ensure the proper dihedral angle. If incorporating rudders, install the hardware now. Install the rudder servo in a slot on the centerline just aft of the wing spar, and then install the pushrods (I used Sullivan micro flexible cable pushrods). Glue the turtledeck top spine into place on the wing centerline. Then glue the five interlocking turtledeck bulkheads (T1 through T5) into place. If you chose to install rudders, you’ll need to cut a clearance hole in the top spine to clear the rudder servo. Next shape and install the aft fuselage top piece. This is probably the most challenging step of building this model, so take your time. 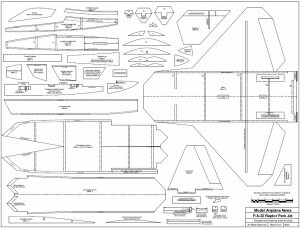 Begin by cutting all the beveled edges in the aft fuselage top piece as shown on the plans. Then cover most of the bottom of the part with packing tape, which will help keep the piece from wrinkling as you heat-form it. Use a heat gun or hair dryer to gently heat the foam, then use your hands to gently form the curvatures required. Test fit the piece onto the model frequently as you go to determine the exact curves required. When done heat-forming, let the part cool and then remove the packing tape from the bottom. Test fit the aft fuselage top piece on the model and trim as required to get a good fit. The fit should be close but it doesn’t have to be perfect, since you can easily use spackling compound later to fill gaps. When satisfied, glue the top piece in place. Use pins and tape to keep the piece in place as the glue dries. Final Assembly Install the receiver, speed control, and wiring. Try to locate components as far forward as possible since this model tends to be tail-heavy. Twist all the ESC wires together to help reduce electromagnetic interference, and tape all wiring down flat against the foam to keep them from flopping around in flight. Make sure to install the speed control where it will get ample cooling. This is especially important on this model since it uses 5 servos, yet most speed controls are only rated for 3 or 4 servos. Providing ample cooling to the BEC will allow it operate more servos safely and help prevent shutdowns due to overheating. Test all controls thoroughly now to make sure everything works properly, since it will be difficult to access this area later. Laminate the inlet diverter piece and inlet side piece together using 3M 77, then glue in place at the front of the inlets. Cut bevels in the sides of the fuselage bottom piece as indicated on the plans. Use a long sanding bar to sand across the bottom edges of the fuselage to make it perfectly flat, then test fit the bottom piece and trim as required for a good fit. When satisfied with the fit, glue the bottom piece in place. Glue on the forward fuselage bottom piece. To help provide a better grip for hand launching, small blister fairings are installed on the fuselage sides. These fairings resemble the landing gear blisters on the real F/A-22, but are a little lower on the fuselage so that your fingers can rest comfortably behind them. To install these fairings, first sand the foam pieces to a domed shape with feathered edges, and then glue them in place at the location shown on the plans (the front end of these fairings is roughly aligned with the recommended CG). Final sand the entire model to shape. To hold the canopy in place I used two small toothpicks installed in the forward edge of the canopy (which slide into matching holes in the forward fuselage), and four small neodymium magnets aft (two in the canopy, two in the fuselage). 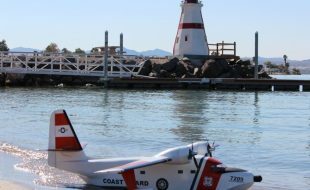 The model can be flown with bare foam, or can be painted with standard acrylic craft paint. Before painting, fill in all rough areas (such as the canopy and nosecone) with lightweight spackling compound and sand to a smooth finish. 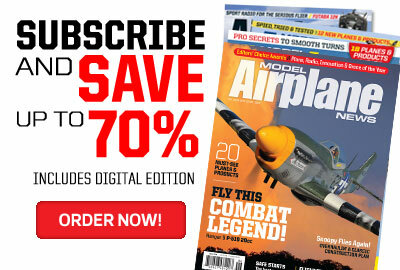 Also be sure to wipe the entire model with rubbing alcohol to remove any grease or dirt. Decals can be made on a computer and printed on full-sheet label paper. For best results, the thrust vectoring servo should be set up using a simple linear mix with the elevator control. Full aft stick should produce 1.5” stabilator deflection and up to 30 degrees thrust vectoring (TV). Ideally this mix should be programmed to a switch on your transmitter so that the TV can be turned on and off in flight, but you can also leave the TV on full time. I recommend starting out with 15 degrees maximum thrust vectoring since it provides amazing maneuverability without making the model seem pitch sensitive. You can go all the way up to 30 degrees TV for even more maneuverability—but you’ll definitely want to be able to turn TV off with a switch since that much throw will make the model pitch sensitive at high speeds. The F/A-22 park jet is easy to hand-launch. Grip the airplane by the fuselage just behind the blister fairings, increase throttle to about 60%, and then throw the model smoothly and moderately hard at about 20 degrees nose up. Make sure to keep your hand away from the prop as you throw it! This model is quick on the controls, but well-mannered and easy to fly. With the TV system off it flies very smoothly and will do large graceful aerobatics, but with the TV system on it will do amazing maneuvers. One of my favorites is the flip. Just slow the model down to around 20 to 30 mph, then quickly pull back on the stick as you give a blip of throttle. The model will pivot around quickly in pitch, and then continue forward flight right after you center the stick. Performing the same maneuver horizontally results in a flip turn. High angle of attack flight is also a lot of fun with this model, due to the very solid pitch control provided by the TV system. 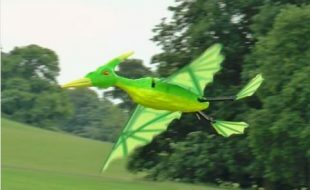 This model handles well at low speeds and is easy to belly land. Fly the approach with a little power to compensate for the increased drag at high angles of attack, and then flare hard about a foot off the ground. Done properly, the model will do a nice nose-high plop into the grass at very low airspeed. Remember to chop power completely and neutralize the elevator right before touchdown, which will protect the propeller and stabilators from damage. To save time building, laser-cut kits of this model, as well as molded clear canopies, are available from www.6mmflyrc.com. Good luck, and I hope you enjoy this model as much as I have! Right now I’m modelling a CESSNA 182. But this really vowed me.. Nice work.. Really useful information. Thanks for sharing. Where can we get the real size blueprint for this one. so i can past it in the form and cut straight away, because the one have in this page is scaled so i cant read any of the text or i cant enlarge it in to the correct size. Is there is any place that i can download this. Please advice me is ther is easy way that i can get this done. -it should be the first one & iv tried to put the link but i don’t know if it’ll work.